What happens during performance testing? This is the second in an occasional series of articles on how IBM does performance testing for the Jazz products. In Creating a performance simulation for Rational Team Concert using Rational Performance Tester - Part 1, I looked at how we build performance scripts, and provided a sample project which included the correlation rules we've built up over several years. In this article, I'll look at some of the common reasons performance tests can fail, and suggest ways of tuning your servers to avoid the common issues. Sometimes the bottlenecks form because of tuning issues, or because of under-powered parts of the test infrastructure. When this happens, the system appears to hit a limit but this limit is artificially low. For example, the performance simulation tool requires hardware in order to run large numbers of users in parallel. The workload is usually spread across multiple machines, but if you don't have enough systems (or they aren't big enough), then the performance tool itself can become a bottleneck. The reason for this is illustrated in the figure below. Each simulated user typically loops through a set of operations, with each operation sending requests to the server under test. For Jazz deployments, we recommend using a reverse proxy; this is an IBM HTTP Server (IHS) in the diagram below. A browser may issue multiple requests in parallel for complex pages, and each request would require a connection to the reverse proxy, and another connection to the application server (in this case, Websphere). In Websphere terms, each HTTP request is processed by a "Web container". Finally, inside the Jazz code, there are two pools which support access to the database (the JDBC connection pool, and the mediator pool). Systems that become non-responsive or appear hung. In the next section, I'll look at how to adjust these settings to better support heavy performance workloads. One final cause of failure can be authentication timeouts, for tests which are designed with a single login step but which run for a long time (hours). If the authentication times out, the rate of failure may increase sharply. I'll look at this in the final section. IBM's test configurations for Jazz products use an IBM HTTP server as a reverse proxy. We raise the value of MaxClients in httpd.cont (see below), often using 2500 as the setting (which allows 2500 active HTTP connections). 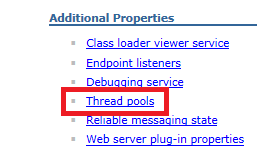 If the HTTP server runs out of threads, this is usually a side effect of an overloaded Jazz server. If the Jazz server is not processing transactions fast enough, the number of active threads in the application server will rise and this causes a rise in the number of active HTTP threads. 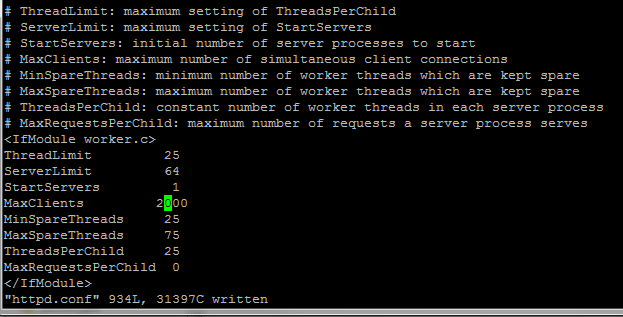 In a performance test, the threads in the keep-alive state are being held open by the performance simulation tool. Be sure that you have enough Web containers so that the server does not run out. This won't guarantee that performance will improve, but it will make it easier to understand where the system bottlenecks are. If you run out of Web containers, the system will fail in such a way as to make it difficult to understand what really happened. 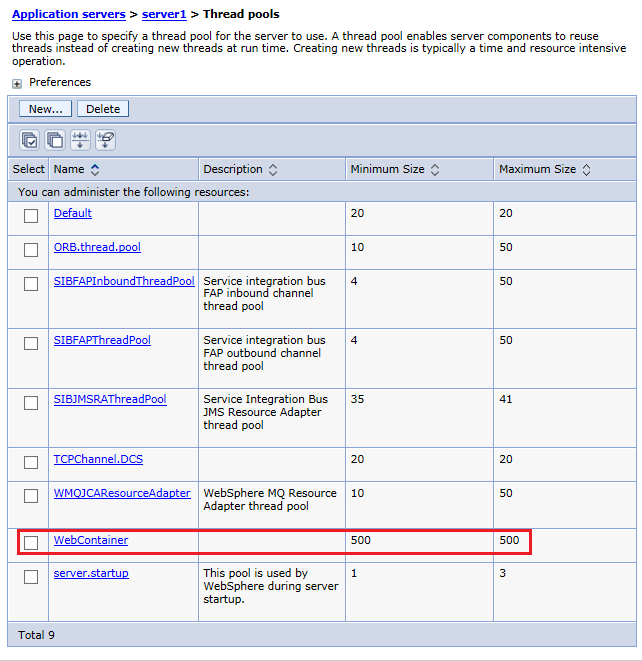 You can configure web container limits for Websphere in the "Thread pools" section of the Server configuration record, using the Websphere admin console. IBM's performance tests for Jazz productions commonly use values up to 500. The next tuning parameters are in the Jazz applications themselves. There are two internal pools used by the Jazz products when they interact with the database server. The default size of these pools is 128. The code will request an object from the pool prior to issuing database requests, but if there are no free objects in the pool, then the code will wait until an object frees up. If the system is falling behind, you may see error messages written to the application logs, because the code will only wait for so long before timing out (default is to wait for 3 seconds). But it is also possible for a queue to form around access to these pools and not see errors in the logs. You can monitor the length of the queues by using the internal counters. These are available via a URL (see below). 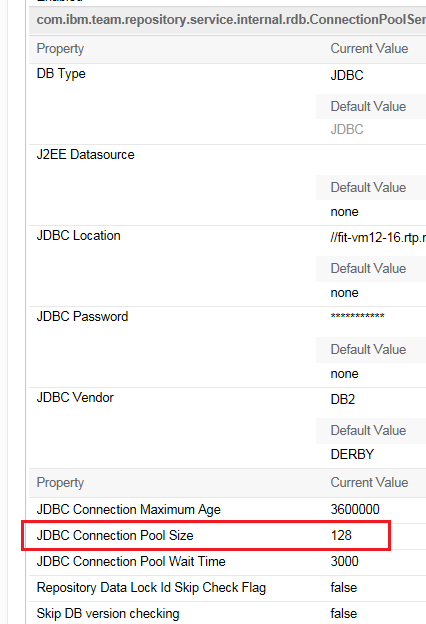 If you see a non-zero value for the max queue length of either the JDBC connection pool or the RDB mediator pool, you should increase the pool size. Note that there are separate settings for each Jazz application, so you should check and configure each application separately (impacted apps: Jazz Team Server, Rational Quality Manager, Rational Team Concert, DOORS Next Generation). In our own performance testing, we often configure the size of both of these pools to be 500. Dashboard simulations may fail under high levels of concurrency if the simulated dashboards run work item queries. The failure is usually an HTTP status 410, with an error message indicating that the query expired. You can work around this by increasing the query cache size (ccm/admin, Advanced Server properties, QueryService section). Set this value to be higher than the number of dashboard users you are simulating. Another factor to consider when doing performance tests is the duration of the test. If a test runs long enough, authentication tokens may expire. If your test only logs in once, then you will eventually run into this if you run long enough. In a Web browser, this would not be a problem - the server would ask the Web browser to reauthenticate, and the browser would prompt the user to enter their credentials. However, Rational Performance Tester scripts are not flexible enough to respond to an authentication challenge. You can find these in the Advanced Properties section in Server administration. Be sure to update settings for your JTS as well as for any CLM application servers (e.g. go to both jts/admin and ccm/admin if you are testing RTC). 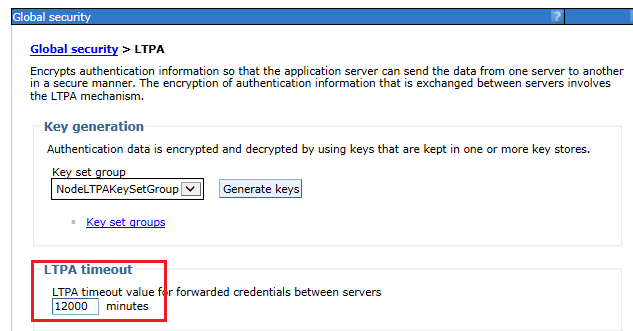 To configure the LTPA token timeout, go to the Websphere administration console (in the Global security section), and select LTPA. Specify a value (in minutes) that is longer than your longest test. Also adjust the Advanced Property setting of "Jazz Authentication token expiration time" if you're receiving HTTP 500 errors in the Jazz GUI. To increase the session timeout in Tomcat, edit the ..server\tomcat\webapps\jts\WEB-INF\web.xml file. Specify a value (in minutes) that is longer than your longest test. To increase the session timeout in WebSphere Liberty, edit the ..server\liberty\servers\clm\server.xml file. Specify a value (in minutes) that is longer than your longest test. While the tuning parameters discussed here may improve system behavior in some cases, you will eventually hit a limit if you keeping increasing the load on the server. But if you've followed these guidelines, the limits you see should not be artificially low and the interpretation of your performance results should be a bit simpler.